I previously wrote about vanishing professions, professions that are in danger of disappearing due to the march of progress. This potter's craft could be one of them. Our first stop was in Lezo in Aklan, on a street where a community of potters lived. 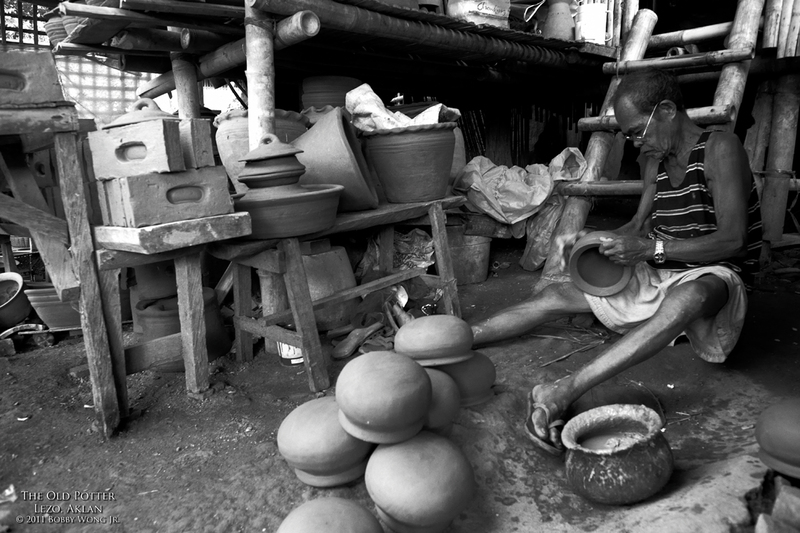 They made pots, bowls, bricks, vases, all from red earth. I immediately noticed no young people were at work. Everyone looked like they've been at it for a generation. I learned this community had been doing this for as far as they remember, since the time of the grand parents of their grand parents. It's an art and a profession that has sustained them. Unfortunately unless their children take it up, photographs like this week's postcard may be a thing of the past. Enjoy. Where in the world is Lezo, Aklan? It's a Monday morning in the city, and I'm sitting at my desk wondering why I'm not a hundred miles away, stalking my next postcard. My mind drifts to a recent trip, to a little boy who was also at his own desk-of-sorts, except that his desk was out in a verdant field and surrounded by an endless mountain range cloaked in fog. And did I say it was actually a pile of firewood overgrown with wild flowers? We were on our way to Panipiason, Madalag, in Aklan, bouncing up and down on our motorbikes, when we came to a clearing beside the raging Dumalaylay river. We took turns crossing the river on a small bamboo raft, skillfully maneuvered by a pair of boys below the age of 12, and that was when we found this third kid on the other side waiting to be paid. The river crossing wasn't free of course, and it set us back twenty pesos per person per way (about 4 US cents.) But we were happy to pay twice the going rate for the locals, knowing that it helped the kids earn a living, and kept our socks dry for another day. Could that little boy be wondering what it feels like to have a real job, on a real desk, in an air-conditioned room in the city? Keep the job kid. Just ask for more money next time. Enjoy. Where in the world is Madalag, Aklan? Luck favors those who are there. 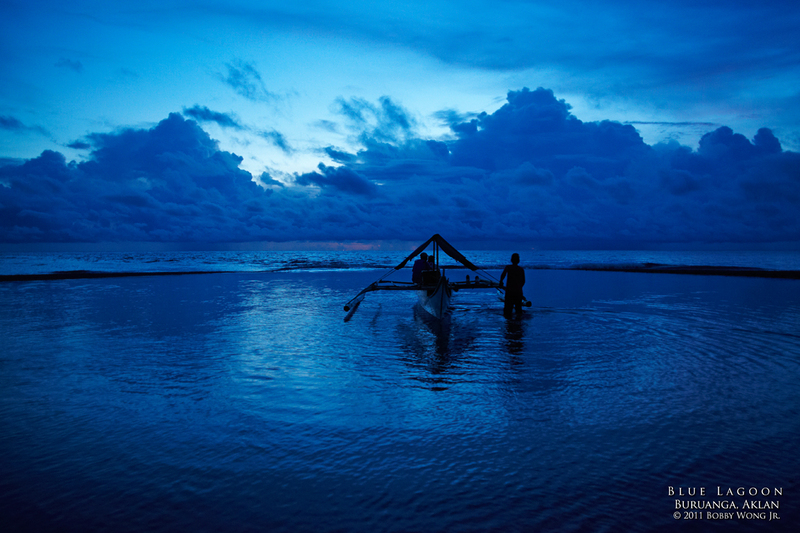 We had just shot the sunset along the beaches on Buruanga, Aklan. We were pretty happy with what we captured, but soon thereafter all color and light started to fade. It even started to drizzle. The folks who strolled the shore along-side us had all gone home. We looked at each other, and then at the empty composition in front of us. It's time to call it a day. But as they say, it's not over until the fat lady sings. Just when we thought it's time to go, a couple of night fishermen hauled their boat from the river bank towards the surf. The cascading ripples in the enclosed lagoon instantly framed them, creating a picture-perfect opportunity. And the dying light of dusk, from a camera sensor's point-of-view, painted everything a brilliant blue. Some people think we're such awesome photographers, but in truth the most important part was just being there. Enjoy. Where in the world is Buruanga, Aklan? We were at the Katunggan It Ibajay (Mangroves of Ibajay), a protected mangrove park in the town of Ibajay in Aklan. Nothing we've seen or read about this place prepared us for what we saw. It's primarily a protected national treasure where 80% of indigenous mangroves are found. And we all know the role mangroves play in the health of our reefs and marine life. But the surprise is that the inside of a well-preserved mangrove forest can be such a photographer's haven! Walking through an elevated bamboo walkway, we were quickly surrounded by mangrove trunks and branches. The forest floor is flooded and the fast moving water from the rising tide turns the multitude of reflections into an avalanche of quivering patterns and colors. We were stunned. 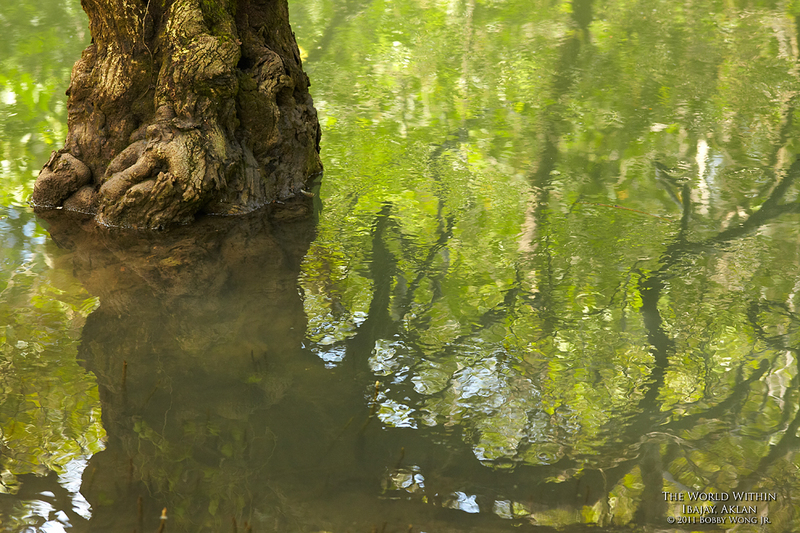 This week's postcard features a living mangrove tree and the reflections around its base. Do you see what I see? Yes, within a mangrove forest, beauty is everywhere. Enjoy. Where in the world is the Ibajay in Aklan?